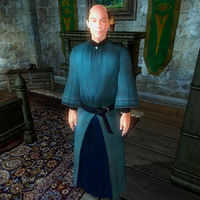 Sulinus Vassinus, an Imperial sorcerer, is an Evoker of the Mages Guild who offers basic Conjuration training and sells spells at the Skingrad Guild Hall. He lives a relatively simple existence, eating lunch from midday to 2pm and dinner from 6pm to 8pm, and sleeping in his room in the Living Quarters from 2am to 9am. He spends the rest of the day wandering around the Guild building. He wears the standard mage's robe and a pair of green velvet shoes, and carries a small amount of gold. In combat he relies on a silver shortsword and on a large set of basic Apprentice-level spells from all of the magical schools. These are the same spells that you can buy cheaply from him, since his Mercantile is a mere 16. He will always be available for training when not eating or sleeping. The first time you meet him, he will politely introduce himself: "I'm Sulinus Vassinus of the Mages Guild, and I'm so pleased to make your acquaintance." If you are not in the Guild, he will strongly recommend that you join: "The guild has quite a few connections, and it always helps to know the right people, wouldn't you say? You should think about joining." After you have joined, he will give you some information on the services provided in the Skingrad Mages Guild: "Have you met Adrienne Berene, our Skingrad Mages Guild head? Not the most pleasant person, I'll admit. Don't mind her. Interested in training? I do the Conjuration courses, and Druja does the Mysticism." He will also drop in a word or two about higher level training: "The guild can provide you with some training, but the best trainers are usually very hard to find." People on the streets of Skingrad will often talk about the local conjurer. When asked for rumors or during private conversations, they will say: "If you're looking to learn a bit about Conjuration, Sulinus Vassinus is a good person to talk to." and "I saw Sulinus Vassinus at the Mages Guild conjure up some sort of creature, right there in the street. Guards took care of it." Their replies, however, often reflects a disrespect for conjuration: "All that conjuring gives me the creeps. There are plenty of scary things in this world without bringing more around." and "I don't want to learn how to conjure things. I want to learn how to get rid of things." Esta página foi modificada pela última vez à(s) 20h39min de 2 de janeiro de 2016.